Tis the season for hats! With fall hopefully just around the corner, I've found myself knitting A LOT of hats these days. I really like knitting hats because not only are they are quick, but they allow for endless creativity. It's fun to play around with different colors and textures to come up with new designs. Here are some recently finished hats and a sneak peek of a hat design coming out soon. 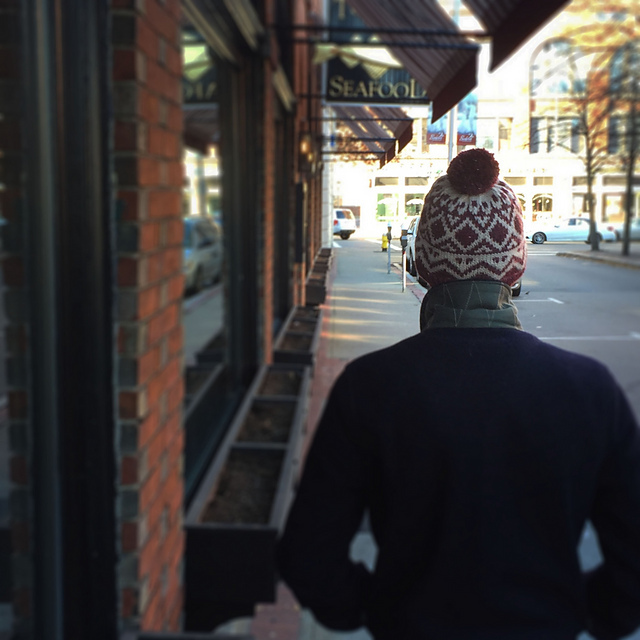 Back when I was in Germany, I knit this gorgeous Bray Cap by Jared Flood using Cascade 220 in Doeskin Heather and Citron. I've been seeing this brown and lime green color combo a lot on instagram lately, so I'm glad to see that this hat will be in trend this fall! I followed the pattern completely as is, except I added a little color contrast for the tubular cast on, crown shaping, and pom pom. While Brooklyn Tweed patterns are a little pricey ($7 for this pattern), they are well worth the price. The patterns are very professional and they explain every technique. For instance, in the Bray Cap pattern, the tubular cast on for 2x2 ribbing is explained with great detail. 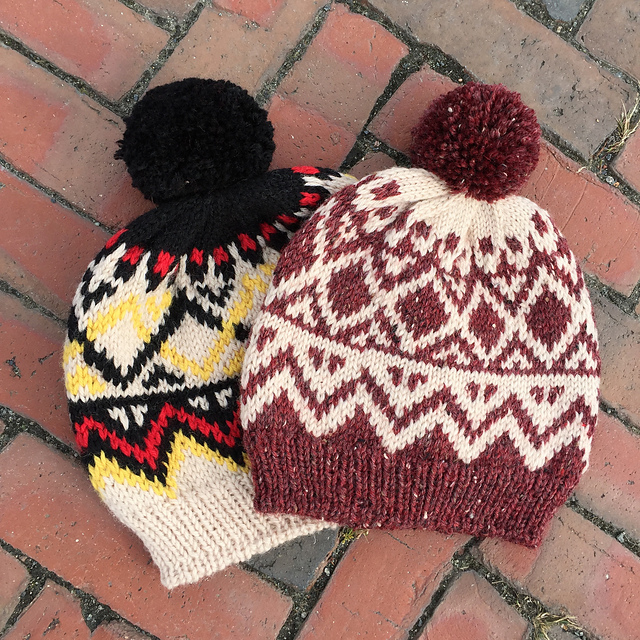 These two cabled hats were made as I was swatching/testing my new hat design, Micalet. 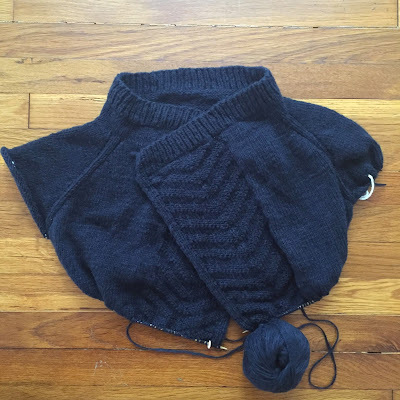 I thought about waiting until the pattern was out before introducing this pattern on the blog, but I'm too impatient. Plus I've shared a bunch of pictures on instagram and facebook already. I'm the worst secret/surprise keeper there is, but what can I say, I love the instant gratification... that's why I knit a lot of hats! 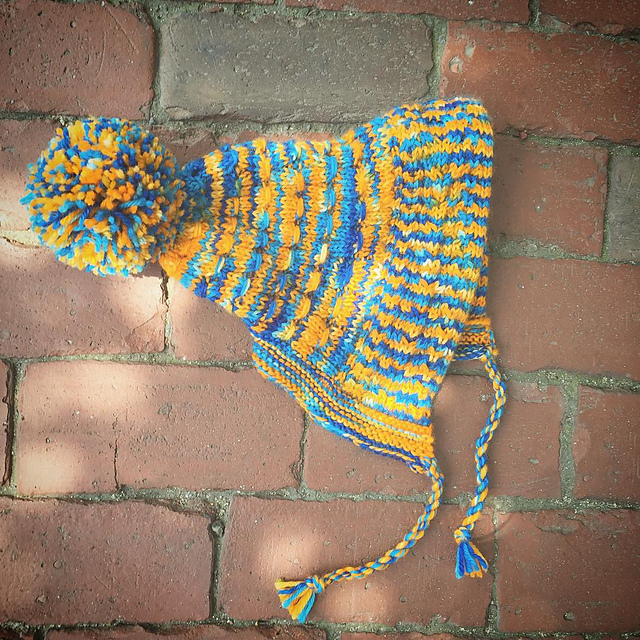 I won't say too much about these hats now because I don't want to spoil all of the fun, but here's one last spoiling detail to hold you over.... the pattern is made for this amazing yarn from Toil and Trouble, which is hand-dyed in Salem, MA by Ana Campos. 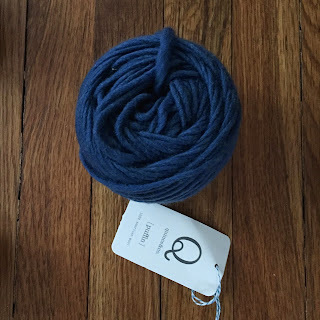 Ana also owns Circle of Stitches in Salem, MA, which has become my go-to LYS since I've moved to the north shore. Her yarns are absolutely gorgeous, and I can't wait to see (and feel) this finished project! I casted on last night, so the pattern will be out before Labor Day. If you check back on the blog the day the pattern is released, not only will I divulge all of the details, but I'll add a coupon code to use on release day... so keep your eyes peeled! First, let me apologize for abandoning my blog while I was in Europe. 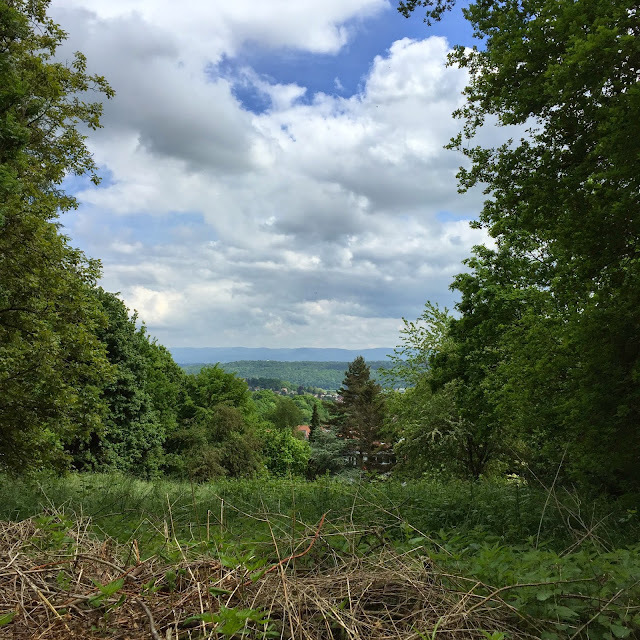 I wish I could say that I was too busy exploring German countryside, hiking the Swiss Alps, knitting with the finest of Wollemeise and drinking wine, but alas, that was not true. Instead, I was hard at work and putting in a lot of hours at the lab. 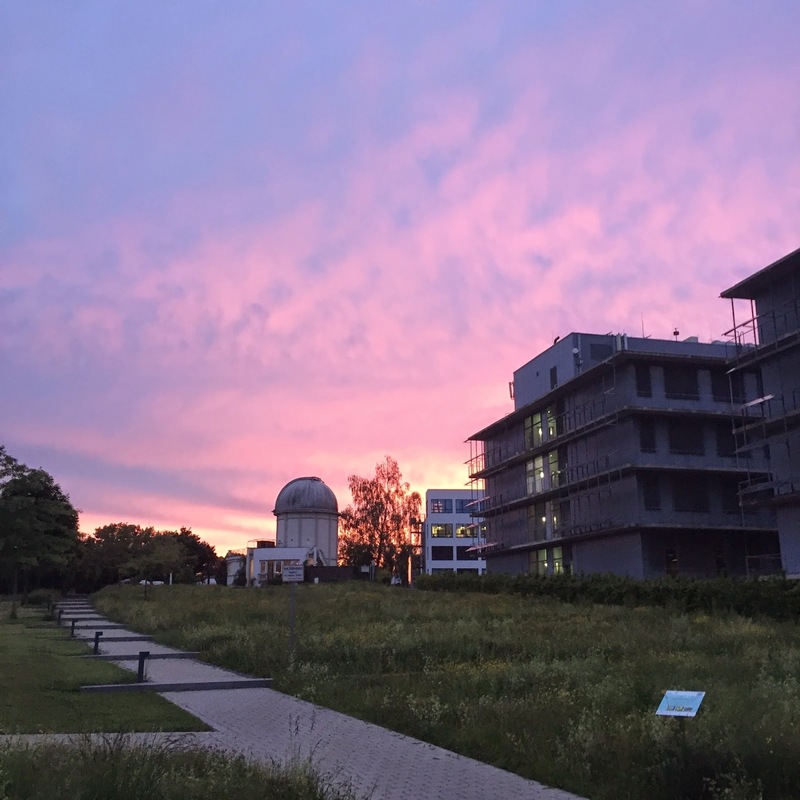 While that might sound lame, the truth is, I really enjoy working in the lab in Germany. It was really great to see some old friends again and make some new ones too!I did manage to do some knitting while I was abroad, but I'm going to fast forward for now -- I promise I'll come back to Europe in later posts. These past few weeks I've doing a lot of knitting and I'm excited to show off some of my recent FO's! A few weeks ago now, I saw on Facebook that Diane Ivey of Lady Dye Yarns was looking for knitters to make samples using her yarn to display at Stitches Midwest. And for payment, a few skeins of her yarn! Let's be honest, who wouldn't knit for more yarn? 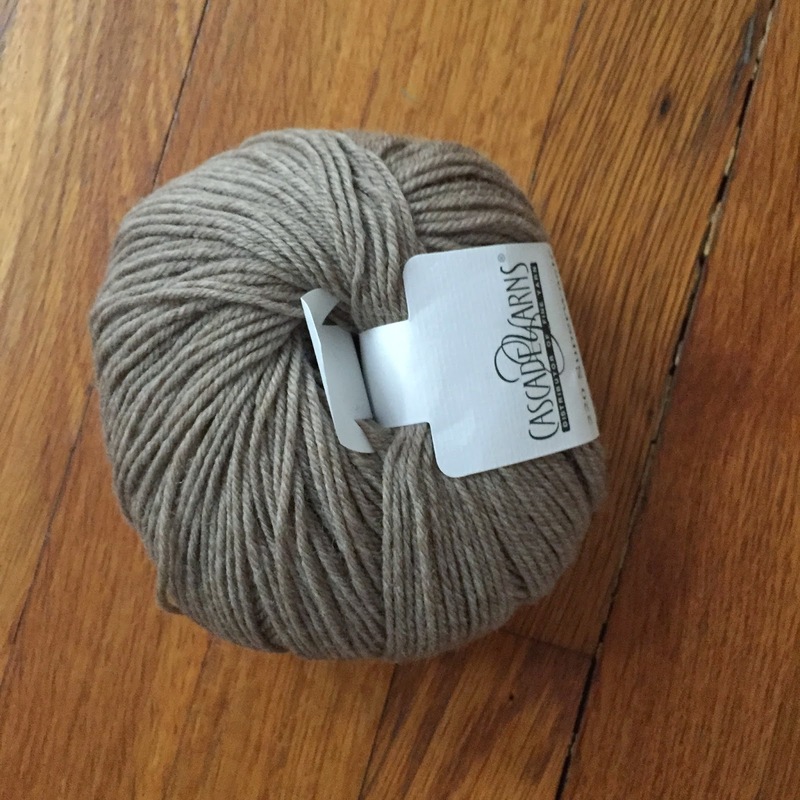 When I picked up the yarn from Diane, I asked what she wanted me to knit, assuming she had a pattern in mind. But then the deal got even sweeter..... she said it would be great if I could make a hat, but it was up to me to decide what to make. How awesome is that?? Not only did I get the fun of knitting with something with free funky yarn, but also I got an excuse to browse ravelry for a few hours with an actual purpose. 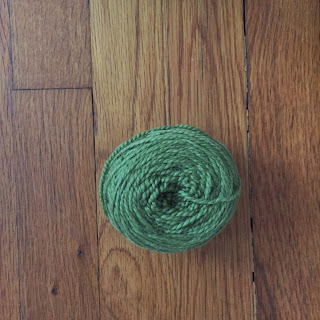 So here's a picture of the yarn she gave me for knitting the sample -- two skeins of her Worsted Superwash Merino. 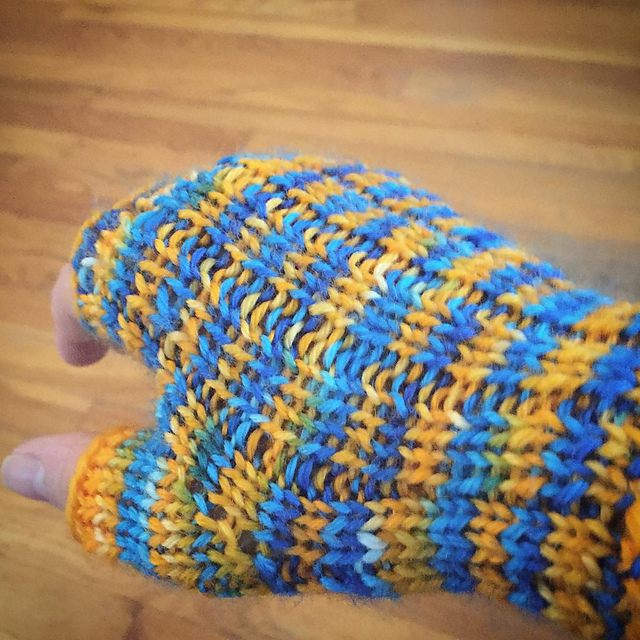 Now, I'll be honest, I rarely knit with variegated yarn. Initially, I didn't know what would be the best type of pattern for this yarn... simple, textured, lacy, cabled? Not to mention that "blue-orange" is a bold color combo. Luckily Diane did give me a little direction saying that something cabled would look better than something lacy. 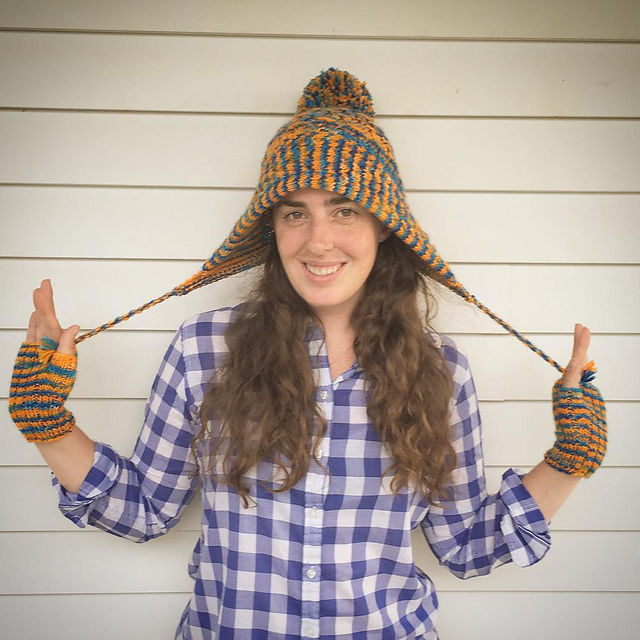 With that in mind, I searched ravelry with terms like "cable", "hat", and "variegated" and eventually spotted the pattern for the Neon Ski Hat. I remembered this pattern was used in a reddit KAL, and I just loved the projects that came out of it. Specifically, I liked that the hat was not a regular, old hat. 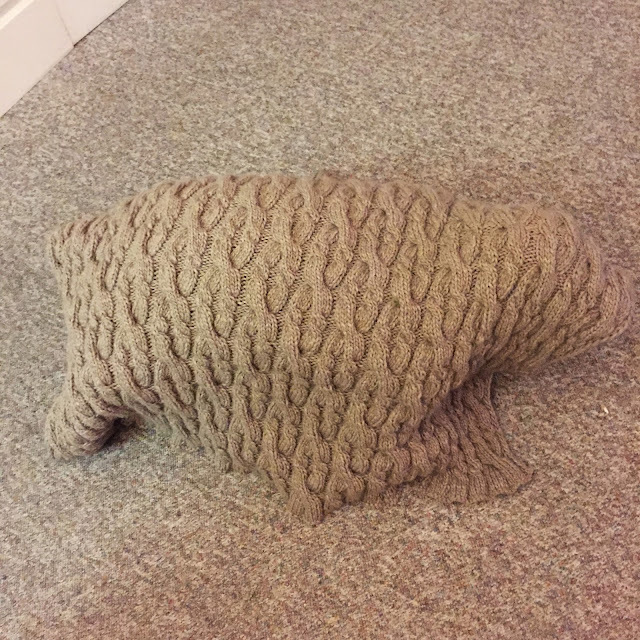 It has a unique shape and a ton of texture, giving off a fun and jovial vibe to match that of the yarn. In the end, the hat actually turned out even better than I imagined! 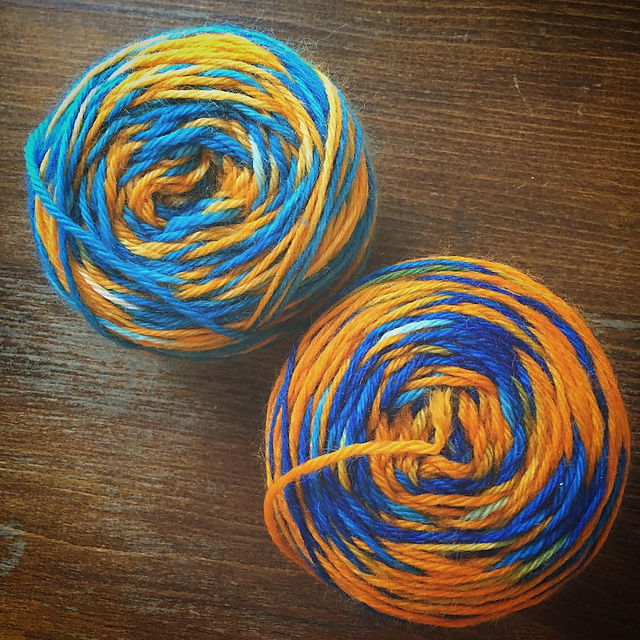 So a few notes... You might have noticed that one skein was a bit lighter than the other. The simple solution to that was to alternate the skeins every round and every two rows when knitting flat. Also, the "body" of the hat is initially knit flat and then joined in the round, but the stitch pattern didn't line up when I went to join in the round. Fortunately, I found notes from MooBooBaby's project which described exactly how to avoid this problem for a large size hat. Me modeling the Neon Ski Hat and Maine Morning Mitts. I had some yarn leftover, so I also made some mittens to match! I wasn't sure exactly how much yarn I had left, so I opted for making some fingerless mitts. The Maine Morning Mitts pattern I used was quick and easy. I managed to finish them in one afternoon. No significant mods here, except that I made them a bit shorter than original pattern called for. From this experience I've learned that I need to be less hesitant my yarn choices. Me of the past would steer clear of variegated yarn, because I didn't know how to use it. Fortunately now I have a bit more confidence with choosing good patterns for variegated yarn, which is perfect since I have two more skeins of Lady Dye Yarns to play with! 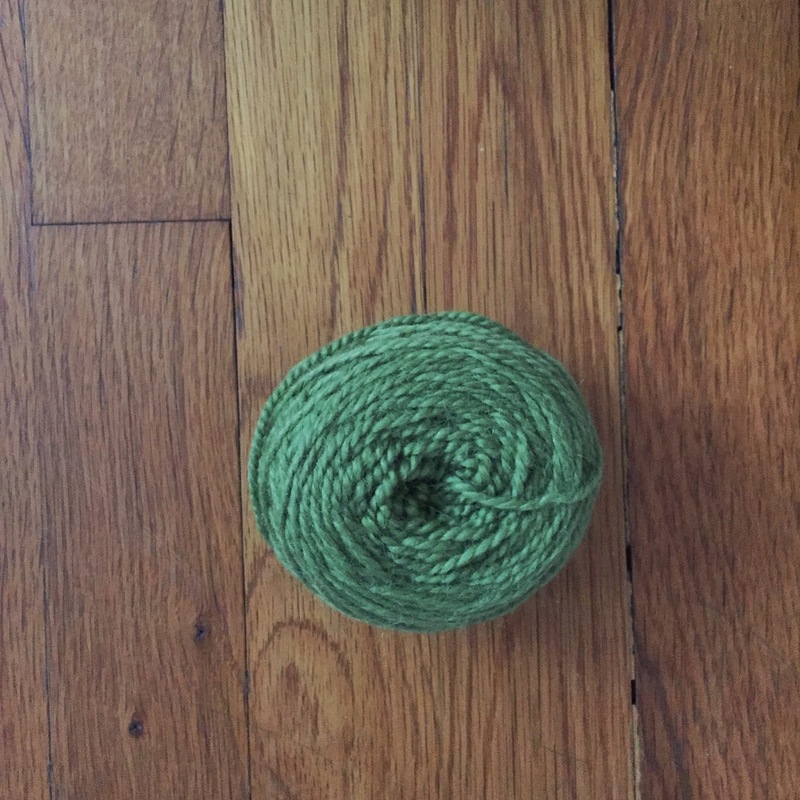 Yarn from Lady Dye Yarns for more fun variegated projects! 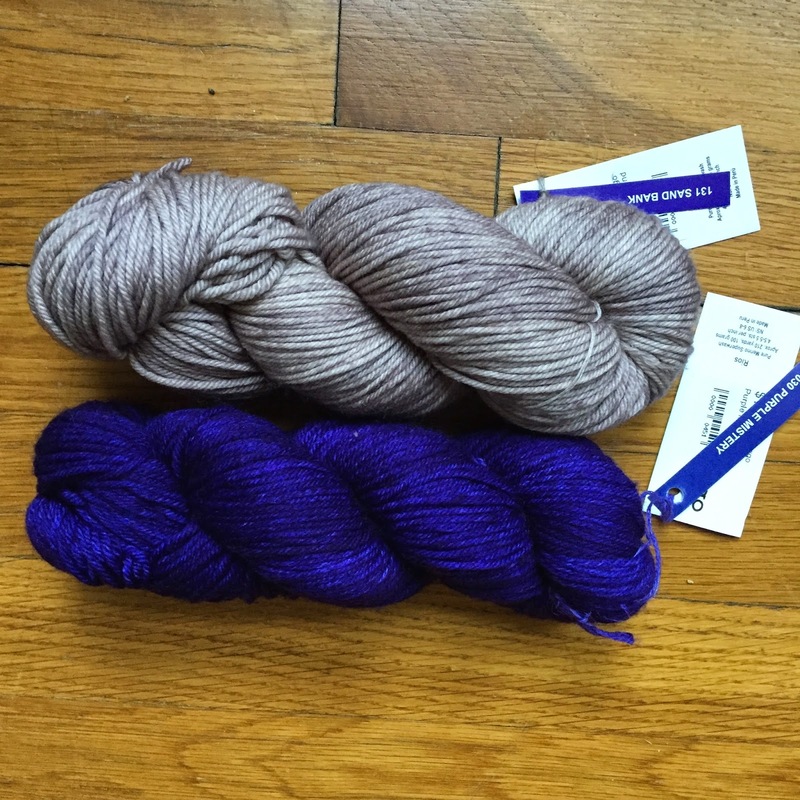 Thanks again Diane for the awesome yarn and for changing my mind about variegated yarn! Have fun at Stitches Midwest this weekend!! The view of some mountains from behind the guest house I'm staying in. 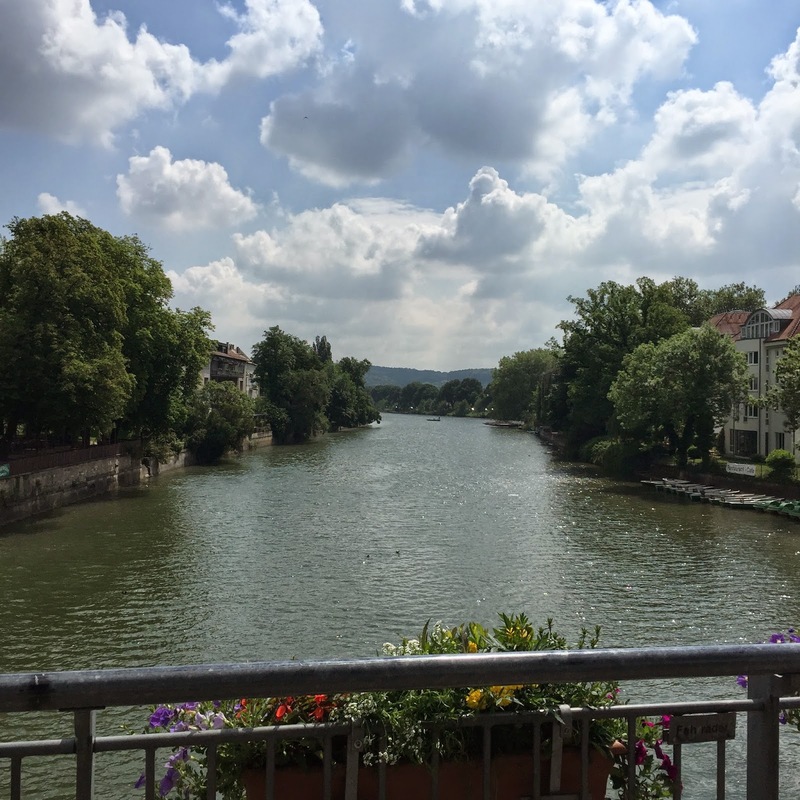 View of the river in the downtown Tübingen. Sunset behind my work building. Quaint little cafe in downtown :) Maybe I'll have a coffee from there just to see if it tastes the same, but for now I'm enjoying my espressos and cappuccinos. These are just the few pictures I've taken so far. Trust me there will be more. 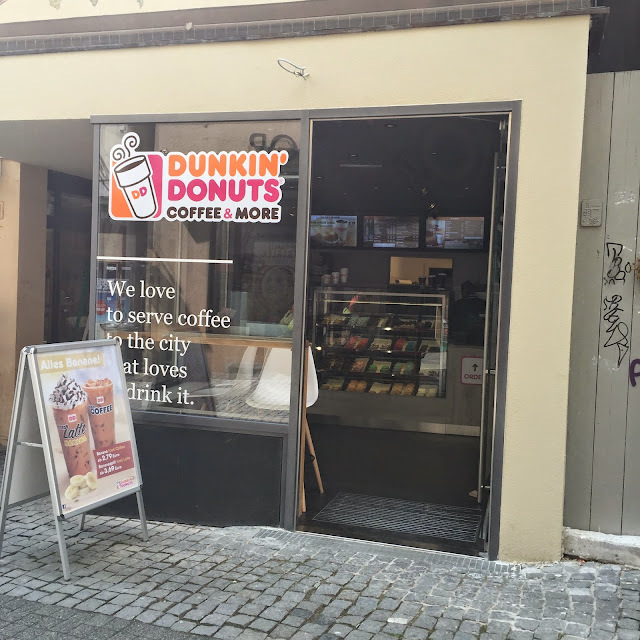 The one thing I like about Germany is that it is still quite traditional. All shops are closed on Sunday and typically closed during lunch hours as well. In Bavaria, which I visited during my last trip, women still wear dirndls on a daily basis (think women at Octoberfest). So this week, I picked out two traditional German-themed favorites for this week. The Traveling Stitch Legwarmers are tight-fitting legwarmers with an intricate pattern of made with twisted stitches. This style is very common in Bavaria (Southwest Germany) and Austria, either on sweaters or high socks (again, think men at Octoberfest). I love the idea of wearing these with leggings and an oversized sweater for fall. 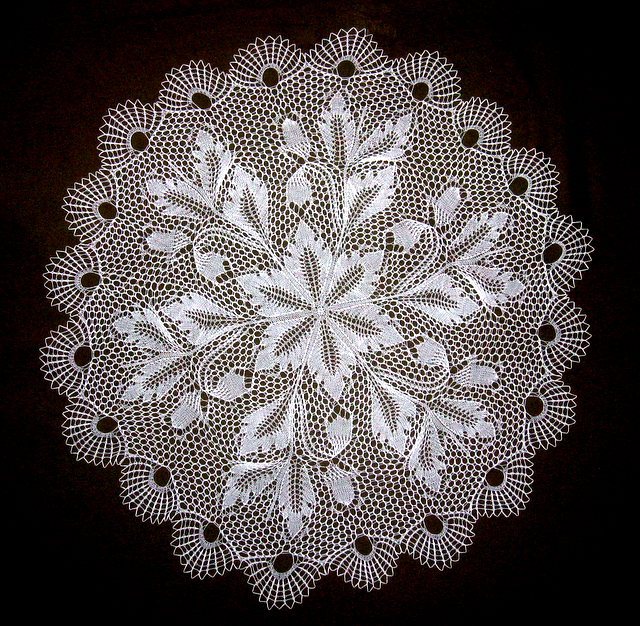 Who doesn't love Herbert Niebling lace? 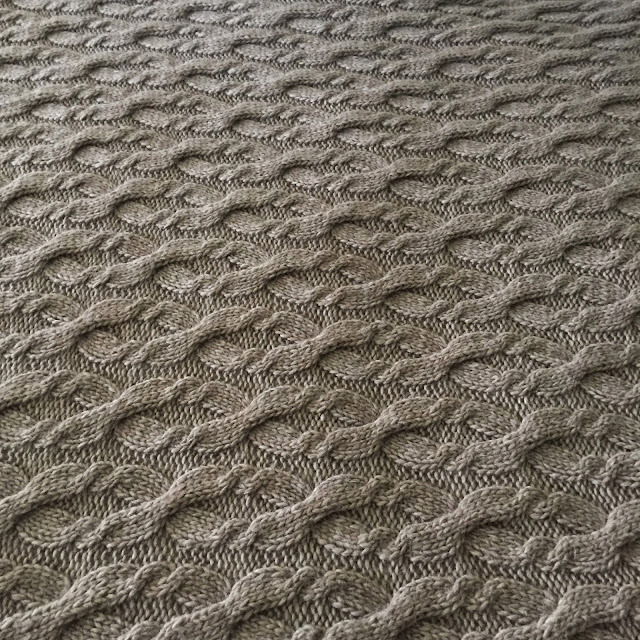 Most of his lace patterns are in German, but the few on ravelry with English translations are all in my favorites, including this Frosted Ferns Doily. This is one pattern that I REALLY hope to get around to making, because I think it would look so pretty on dining table. Michael and I don't have a dining table in our apartment yet, so that means I still have some time to make one! I hope to dedicate most of my time this Memorial Day weekend to knitting. I'll admit I've been slacking the past few days on my Caramel Cardigan. More progress (and pictures) next week! ... a cute, sleek, and modern sweater!! Granted, it appears that the project has been in hibernation for 9 years, and is most likely frogged by now. 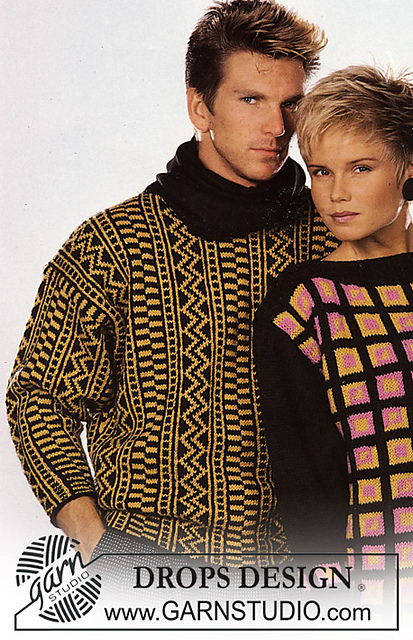 Nonetheless, it serves as great inspiration that any pattern, even a horrendous 80's sweater pattern, has the potential to be something great. Here's another sweater gem I've favorited after a few hours of mindless browsing. I favorited it because of the mix of textures. I think this would make a fun fall sweater a darker color - navy blue or black. 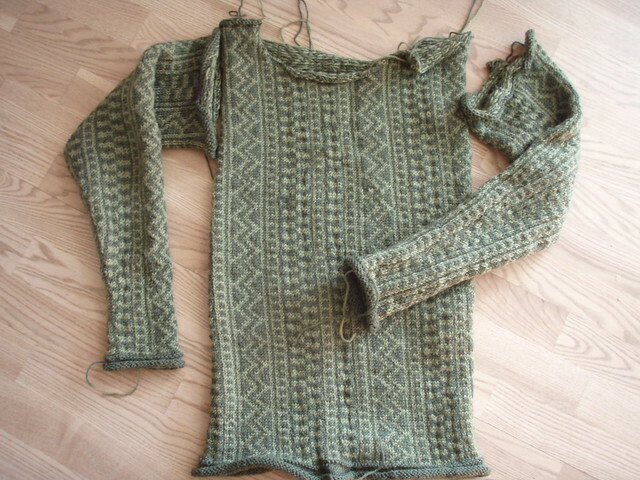 Overall this sweater would make a great project, but I do foresee some challenges. First, I think the neckline would have to be changed. Second, the pattern only comes in one size, 36" chest, so if that's not your size, then you'd need to do some math. Also a quick update on the Caramel Cardigan since I have yet to any progress pics. Well here you are! I've made some decent progress, and I love how the herringbone detail is coming along. Goal for plane.... finish the body!! Consider this by "Before Plane" progress picture. I'll post the after as soon as get to wifi in Germany. So New England, see you later! I can't wait to share my German adventures with you! As I mentioned in the last post, I am headed for Europe! When? Oh, tomorrow. Have I packed? No way... I haven't even finished unpacking yet. First stop will be Tübingen, Germany for about 3 weeks to work in the Max Planck Institute for Intelligent Systems on a human behavioral/robotics project. Just before I started this blog, I was there from July through December, so it will be nice to go back for a little bit and see all of my German friends again. Plus, after being away from Michael for 6 months, 3 weeks will be a breeze! One of the best parts about staying in Germany is that I have so much extra time. 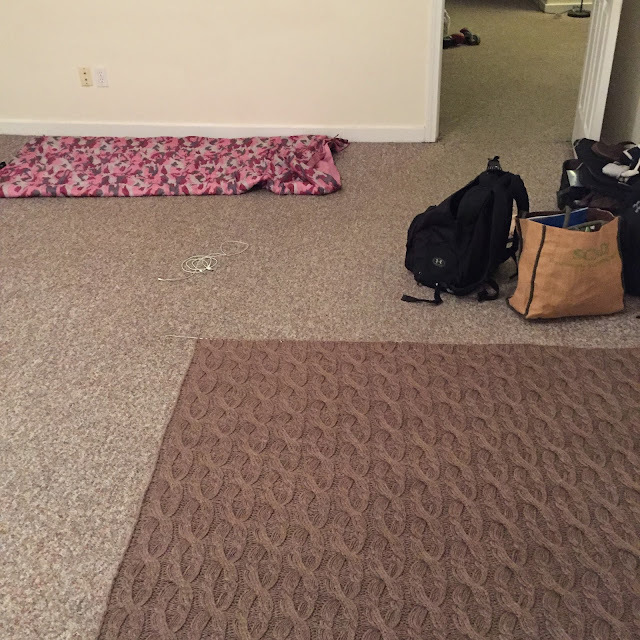 Where I stay, I don't have to cook meals or clean... basically no responsibilities besides work and knitting. During my last visit, was when I really started playing around with designs, including the two hats I freestyled. 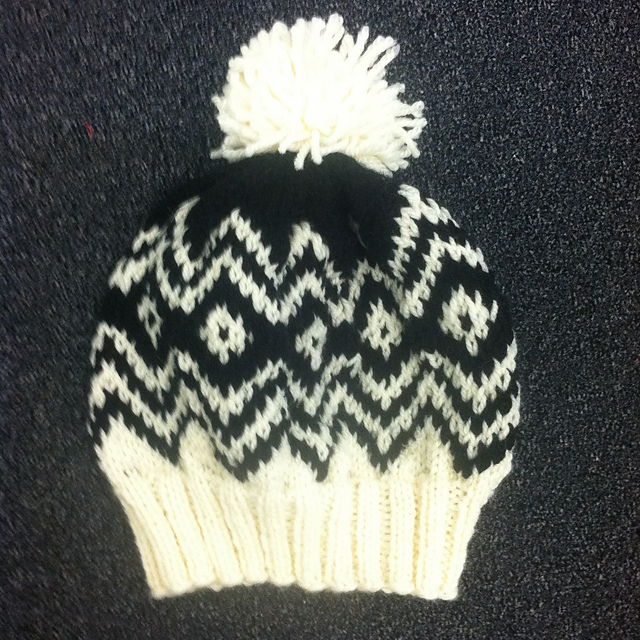 This project was dubbed the "German Ski Hat" because of the colors. and advanced version of the pattern with different numbers of colors. This time around, I want to write these patterns up! Plus come up with a few more :) After Germany I'll be off to Valencia, Spain for one week of conference and then one week of vacation, which Michael will join me for. I'm sooo excited for this! I just happened to find this blog post listing all of the yarn stores (tiendas de lanas) in Valencia. But besides perusing yarn, Michael and I plan to enjoy some relaxation time biking along the coast and drinking wine. Right now, the most important thing I need to think about in terms of packing is what to bring on the transatlantic flight... that's some good quality knitting time. 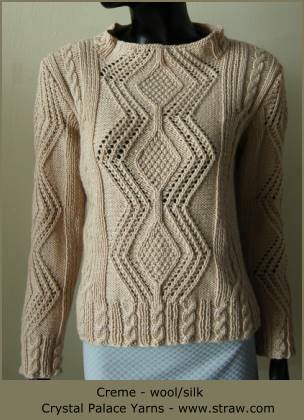 Currently, I'm working on the Caramel cardigan I'm working on, which I need to get some progress pictures of. I also thought I would bring along some yarn to play around with designs. And by some yarn, I mean almost all the yarn I bought last week. Maybe that's too ambitious, but I think it's better to be over prepared than to be stuck on a plane with no knitting. I'll have one more post tomorrow, Favorites Friday, in New England. I better be packed by then!! Boy did this weekend fly by! Probably because it was action-packed with all of my favorite activities: knitting, exploring, brunching, and buying yarn.... plus unpacking, which is definitely not a favorite activity of mine. My adventures started out on Thursday night after work when I ventured over to Sip 'N Stitch night at Circle of Stitches, an adorable new yarn store on the water in Salem. I met two lovely ladies who gave me great advice on where to eat and places to visit throughout town. I also bought two skeins of Malabrigo Rios in Purple Mistery and Sand Bank to start testing a new hat design I've hat swirling around in my head for some time now. 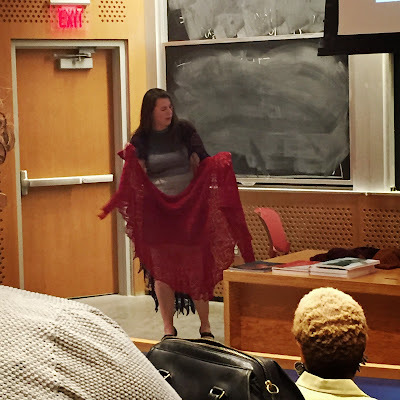 Friday night after work I went to the Common Cod Fiber Guild meeting, where Anna Dalvi gave a talk about her inspirations for designing lace. Not only were her lace designs absolutely gorgeous, but they all had really interesting tales behind them. She told us several of the mythological and fairy tales behind her shawls, and to be clear, these were not the cute kind of fairy tales... we're talking about gory, chopping-up-bodies kinds of fairy tales. It was such a good talk! One day I will get around to making her Eyjafjallajökull Shawl, probably when I learn how to pronounce it. Anna Dalvi giving a talk on the inspiration behind her lace designs. On Saturday, Michael and I did some unpacking, but I will skip that to get to the good stuff. We had an amazing breakfast at The Ugly Mug Diner, a shared plate of pancakes, chipotle hash, eggs, bacon, and parfait. Did I say it was amazing??? 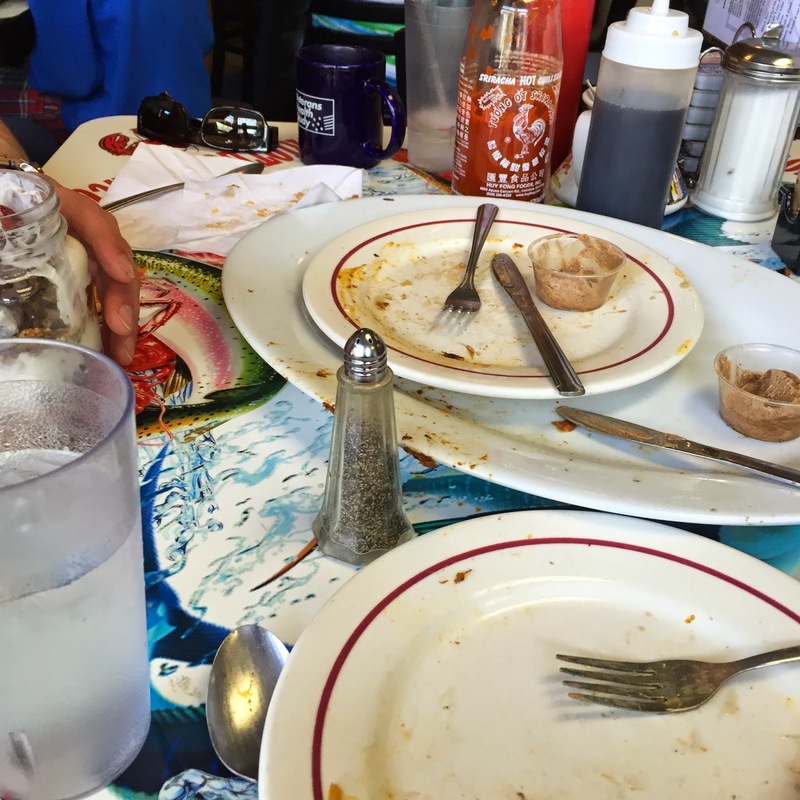 We forgot to take a before shot, but here's the after shot of our amazing breakfast! Surprisingly I didn't fall asleep directly after eating. Instead we hit up yarn store #1. Unfortunately Seed Stitch Fine Yarns, another LYS in Salem is closing at the end of the month, so I took the opportunity to pick up two skeins of Cascade 220 Superwash in Citron and Doeskin Heather, and two skeins of Quince and Co. Puffin in Glacier and Fjord while I still could. (Plus everything was 30% off!) The Cascade will also be for hats, and the Quince and Co. will be for projects using a pattern coming out this winter... sorry for being so vague, but you'll see!! Navy Blue, but I'm sure you can picture the color. Sunday was less fun as it mostly consisted of grocery shopping and working, although we again had an amazing breakfast, this time at Bagel World. 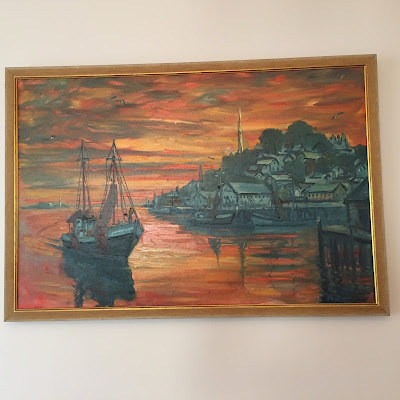 Although, we did pick up and hang an oil painting that we bought while roaming through some of the other in town on Saturday... 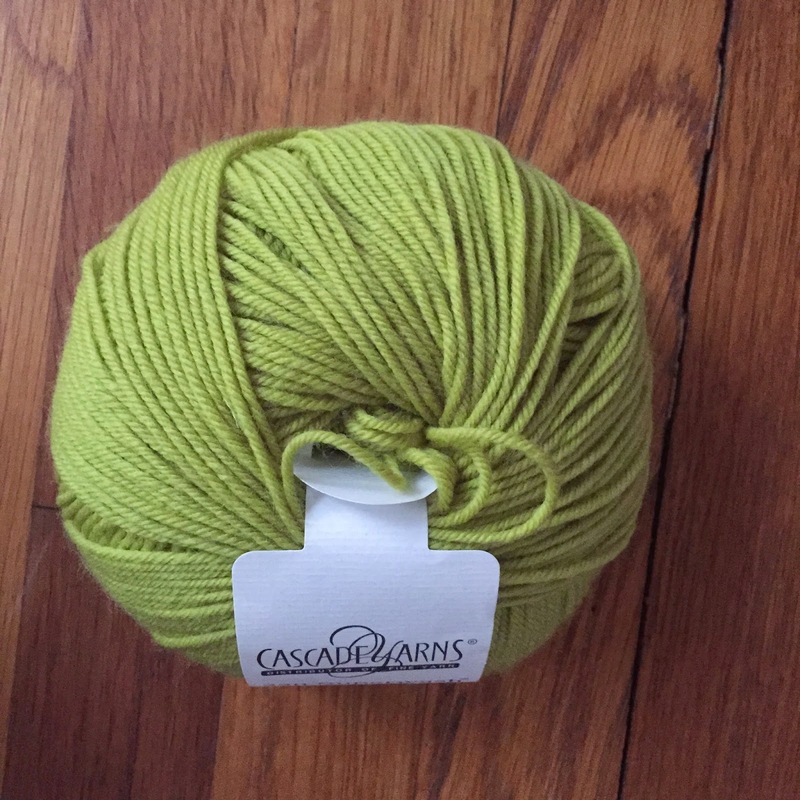 I guess I forgot to mention that there are non-yarn stores in Salem. The painting is of Marblehead, MA at sunset by the late Rockport artist Charles Stepule. When we sit on our couch, we just can't stop looking at this painting. Sorry for my crooked picture! It's the picture not the painting, I swear! I hope your weekend was just as knit-filled! As the title suggests, this is actually my first and last weekend in Salem for awhile. On Friday, I am leaving to work in Germany for a few weeks and then I'm off to Spain for a conference and a little vacation. 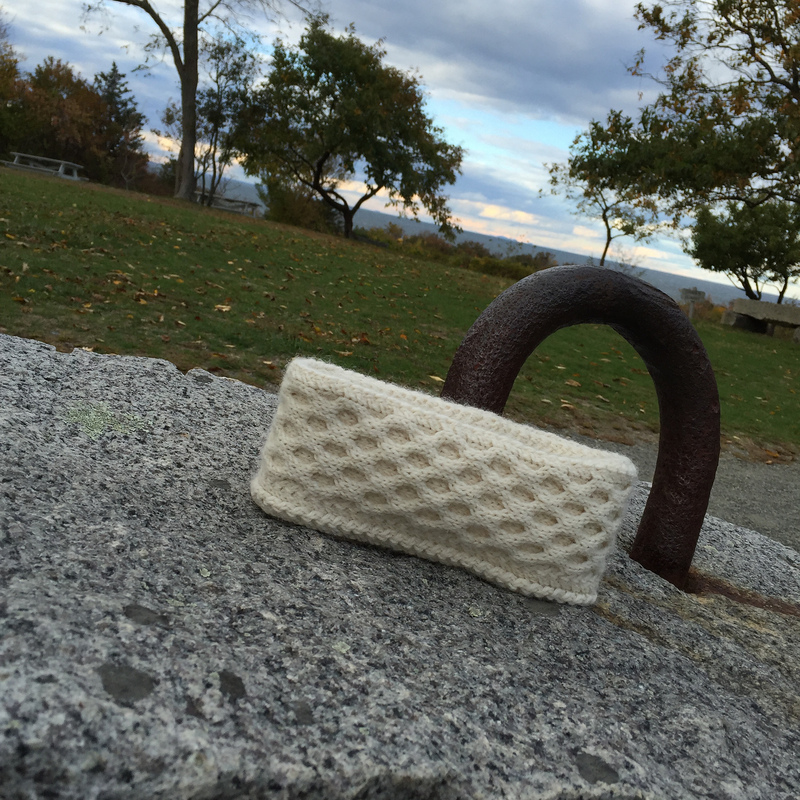 Rest assured, there will be plenty of knitting and blogging, just not in New England. I'll share more about where I'm going and what I'll be knitting next time. Favorites Friday: Spring is in the breezy air! As I mentioned in the last post, Favorites Friday will be a weekly post where I will share three patterns/projects/yarns etc... that made their way into my favorites on ravelry this week. These include patterns and projects that would be on the needles if I had infinite time and yarn that would be in my stash if I had infinite money. It would be great to be inspired by your favorites as well, so see the bottom of this post to learn how to be a contributor to Favorite Friday! Favorites Friday posts don't necessarily have to have a theme, but I noticed that this week, I found myself drawn to Spring-y patterns. It probably has to do with that fact that it's finally hot and sunny in Boston! That being said, I'm not actually one who enjoys incredibly hot weather -- I hate sweating in everyday clothes. I'm more of a "sweatshirt" weather kind of gal... think hot but with a cool ocean breeze at 7pm on an early summer night. Now that I'm getting older though, I feel like I can't pull off the sweatshirt look anymore (although trust me, that doesn't stop me from wearing them). Instead, I'm starting to discover shawls as an alternate source of just the right amount of cozy warmth during the cool Spring and Summer nights. I mean, why wear a sweatshirt when you can wear a beautiful shawl? This is why two of my favorites this week are shawls. When I first started knitting, I'll admit, didn't get shawls. They looked so beautiful but I didn't know how to wear them or what I to wear them with. But then I see pictures like this and it just makes me want to only knit shawls. The first thing that drew my eye to Junius was the color... That gold is absolutely gorgeous. Not only is it a beautiful color for spring and summer, I can easily see that shawl adding a pop of color against a brown or blue blazer in the fall. Plus I love how every part of the shawl is covered with intricate detail. I was also intrigued by this sentence in the pattern description: "The clever increases create shoulder lines that allow the shawl to stay on even without a pin or other closure". I wore a lace shawl yesterday and without a pin it kept coming unraveled during the day, so I'm definitely curious about the construction of this shawl. 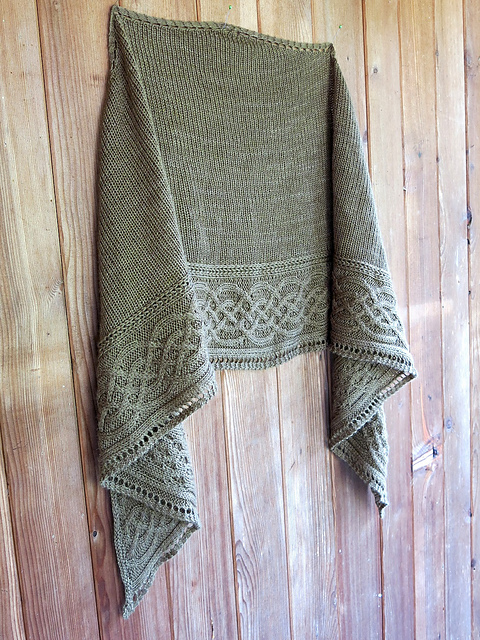 The next shawl I fell in love with this week was Celtic Myths. I like the simple yet elegant look with cabled border plus the little eyelet detail along the edge. I love the simplicity of this shawl the same way I love the intricacy of Junius. 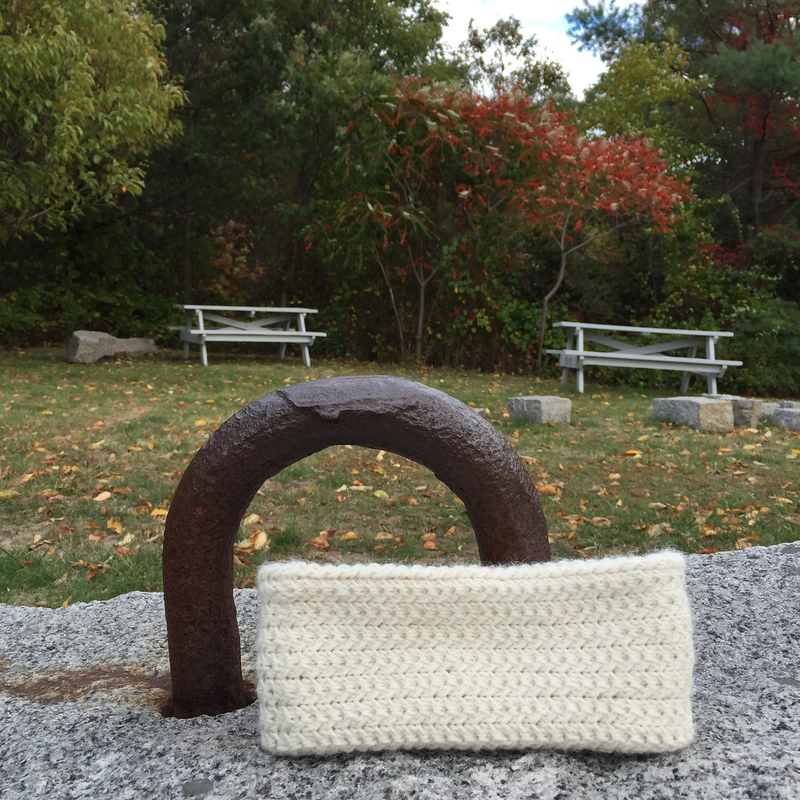 I could see wearing Junius out for dinner or to an outdoor wedding, and wearing Celtic Myths for a walk along the Castle Island in the late afternoon -- not to mention how appropriate the celtic cables would be in South Boston. I see this shawl as being a go-to casual wrap. And, bonus, it's a free pattern! Now this Cancun Boxy Lace Top will probably not provide much warmth, but boy is it cute! This is what I would want to wear if it's really hot outside. I personally would want to make it a little longer for myself though. 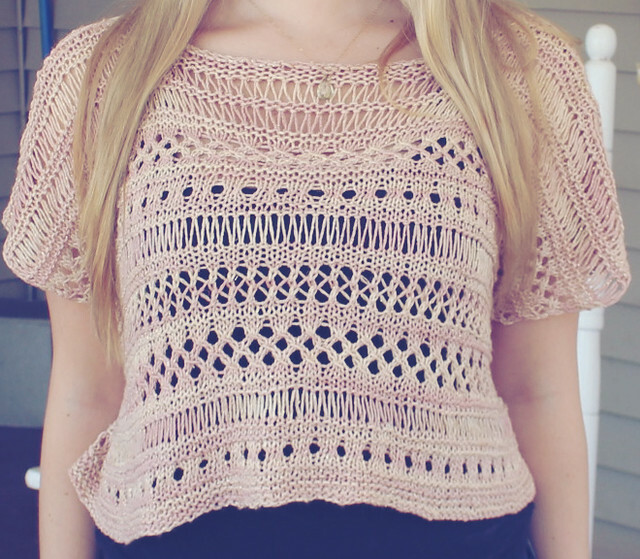 Making this top would be a great way to try some new lace stitches, and you could always add your own in there. Also a free pattern! Plus Erin has an incredibly cute blog with a lot of crafty projects that's worth checking out. Hope you enjoyed the first Favorites Friday post! I'd love to open this up for anyone to contribute, so if you're interested, send me an email with (1) a blurb about yourself and your knitting "style" (e.g. 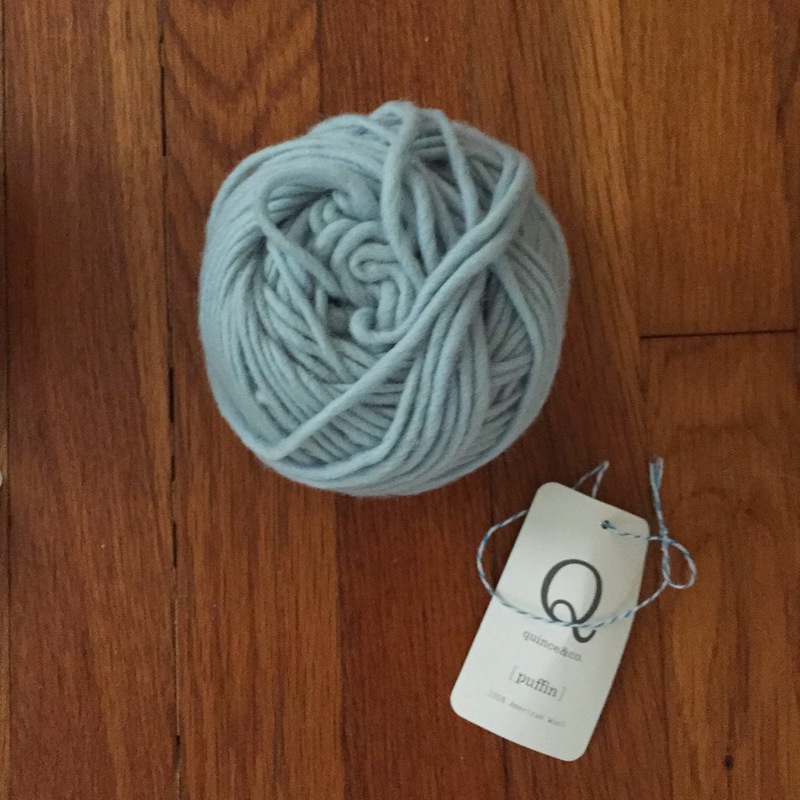 what you are currently knitting, your favorite thing to knit is, your favorite yarn, etc., and (2) links to three things you favorited on ravelry and a short blurb why you favorited them. I'm looking forward to hearing from you all! Share your Favorites on Fridays! If you're anything like me, then I bet you spend a lot of time oohing and ahhing over all of the gorgeous projects on the interwebs. It used to be that when I saw I project I liked, I'd immediately purchase the yarn for it and started knitting.... and I'm sure you can imagine how the projects and yarn added up. Also notice that I didn't say "and then FINISHED knitting" said projects. Nowadays, I've taken more of a realistic approach to how many projects I can handle at a time, especially now that I'm also designing. I've come to accept the fact that I can't knit everything I want to, and that this doesn't have to be a bad thing. I can still enjoy the beauty of other people's work, and well, if there is a project or pattern out there that I keep thinking about over and over again, then I'll put it in the queue! So that is the inspiration for Favorites Friday, which will start tomorrow! On Fridays, I'll post some of the projects/patterns/yarns I've favorited on ravelry throughout the week, basically things I would knit if only there were more hours in the day, let's make that -- days in the week. And since I know I'm not the only one in this predicament, I'd love to open this up for anyone to contribute! Send me an email with (1) a blurb about yourself and your knitting "style" (e.g. 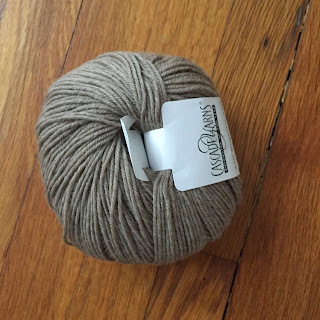 what you are currently knitting, your favorite thing to knit is, your favorite yarn, etc., and (2) links to three things you favorited on ravelry and a short blurb why you favorited them. I'm looking forward to hearing from you all! What a crazy week! I know I made a huge deal about how difficult and time consuming packing would be, but it turned out to be not so bad. That's probably because my process of packing is to throw everything is boxes/bags and cross my fingers that nothing will break. You can definitely tell which boxes I packed versus those that Michael packed --- Michael neatly bubble wrapped fragile items whereas I wrapped our diningware in sweaters. Michael and I enjoying Lobster Martinis after a long day of moving. 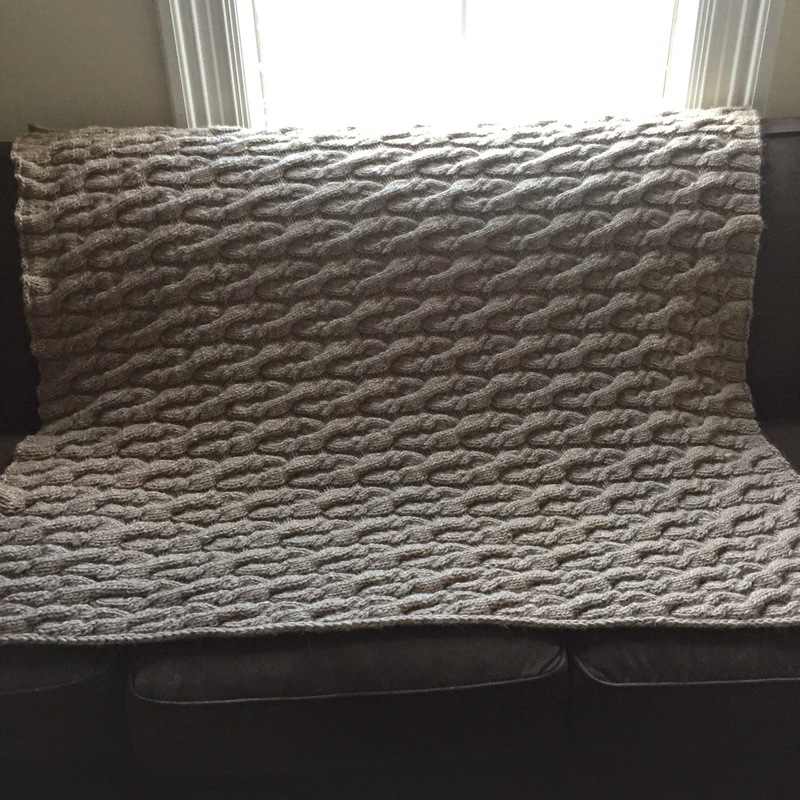 Because packing didn't take as much time as I thought, I was able to squeeze in enough time to finish the Cape Ann Blanket in time for the wedding! You can tell I'm proud of this one by the number of FO pictures I took. First picture right after finishing! This closeup picture is truest in color. 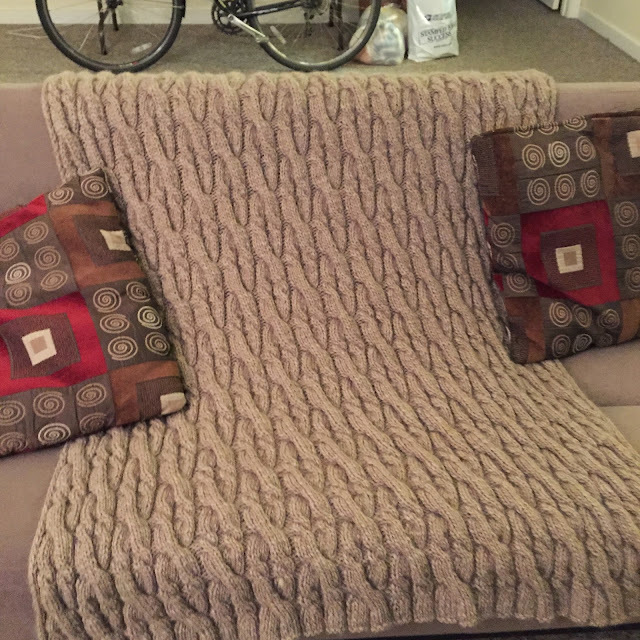 Blanket on another couch... Seriously I took pictures of this blanket everywhere! Dave in his element. I gave him $8 in quarters for letting me post this picture. Although, there were a few snags. 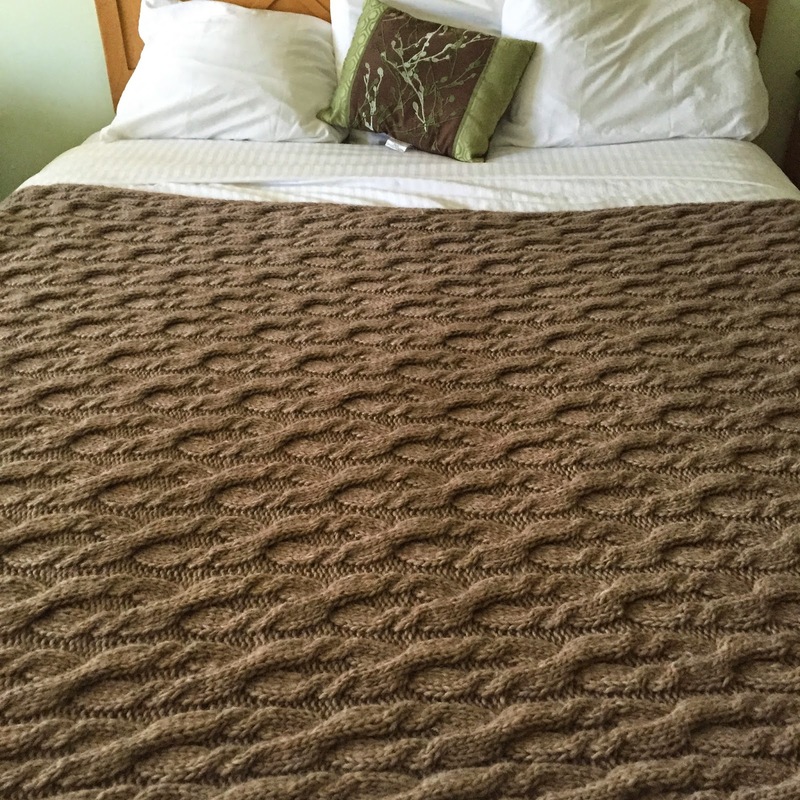 I finished the blanket on Thursday afternoon, and then hand washed and blocked the massive thing that night. I thought 36 hours would be enough to time to let the blanket dry, but I was wrong. Unfortunately I didn't have a fan as it was packed in the moving truck, which I'm sure would have helped. 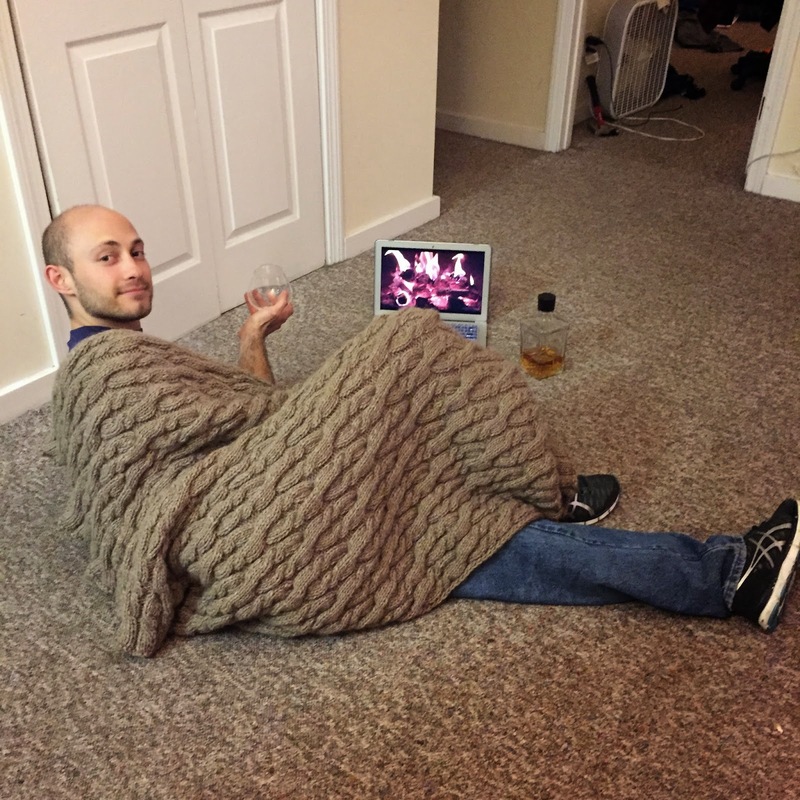 I mean the blanket was dry, but not completely dry in a few places. 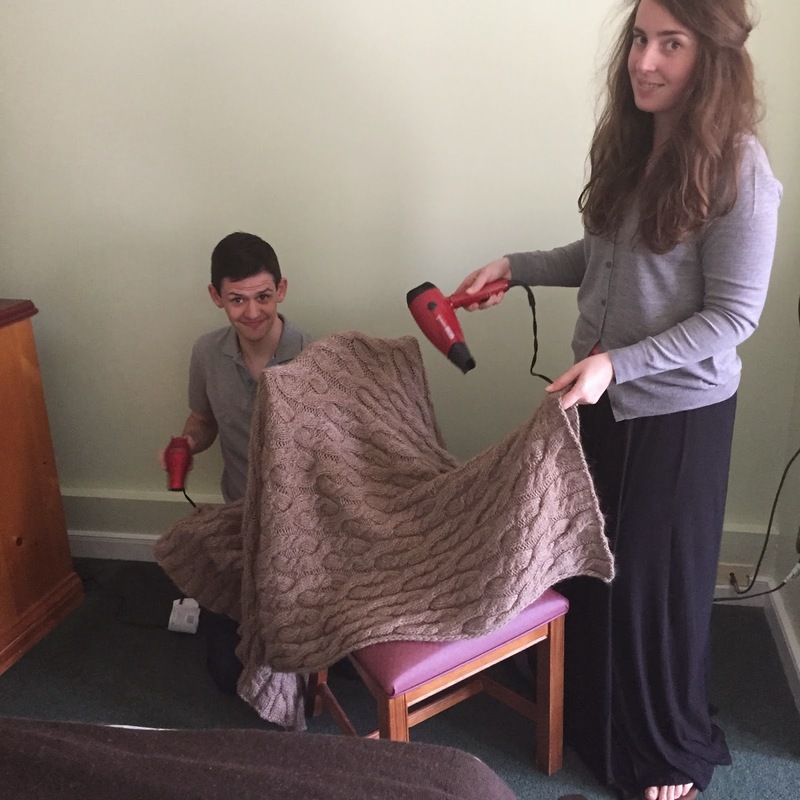 Fortunately, I had my partner in crime help me blow dry the slightly damp spots in the hotel room a few hours before the wedding. And the wedding! Luckily we got there early enough to watch the Nepali ceremony before the Western ceremony. 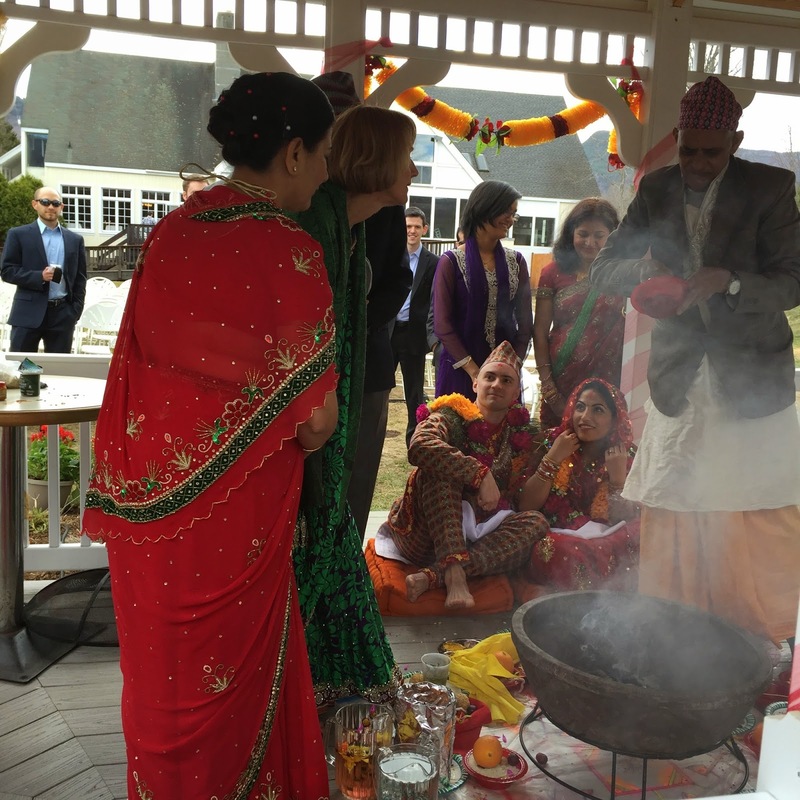 The bride, Bijaya, looked absolutely gorgeous (as did her new husband Brendan of course). I'll admit that most of the time I had no idea what was going on, but Bijaya would occasionally provide commentary --- my favorite being when she turned to Brendan and said nonchalantly, "Now we're married". The reception was a ton of fun too. Michael and I had such an amazing time danced our butts off with friends. I definitely took some notes for the wedding that I have to start planning one of these days. Close up of the bride and groom. 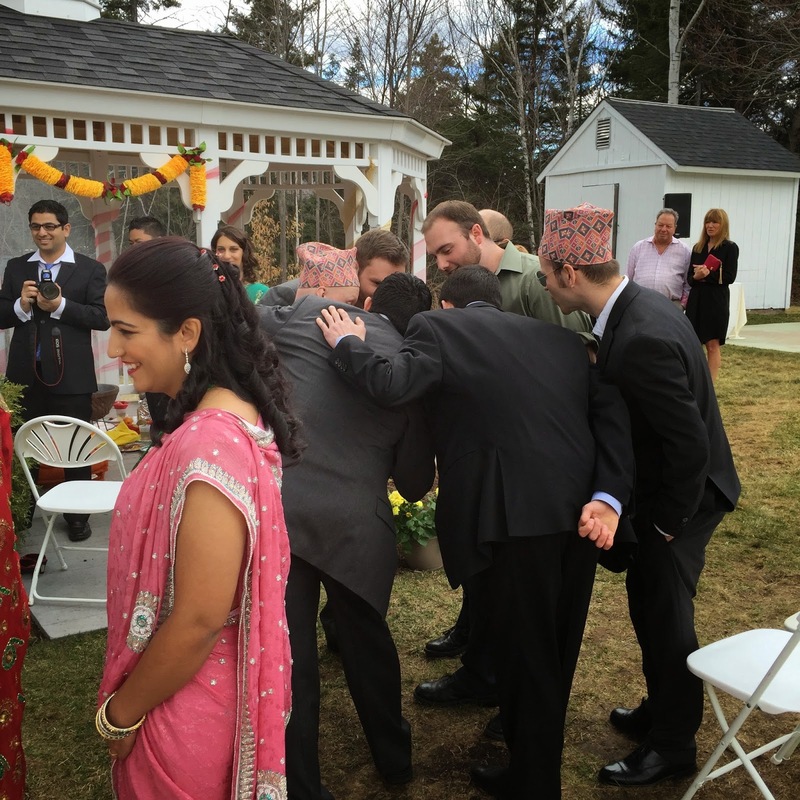 The guys partaking in the tradition of bargaining for the groom's shoes. Getting back to the knitting... Now that the blanket is done, I'm jumping into the Caramel cardigan I mentioned last post. I feel like I'm skipping summer and jumping right into fall knits, but I'm okay with that. It means I'll be able to wear the project soon after I finish. But then again, maybe I'll cast on Celes by Jared Flood in the next few days too. I've been eyeing this pattern for a while now. What a gorgeous spring/summer/fall scarf this would make!